IMAGINE THE WEIGHT OF A WORLD CHAMPIONSHIP MEDAL AROUND YOUR NECK. Maybe you tuck it into your uni after it’s put around your neck. Maybe you let it bounce against your chest as you walk the boat back to the racks. 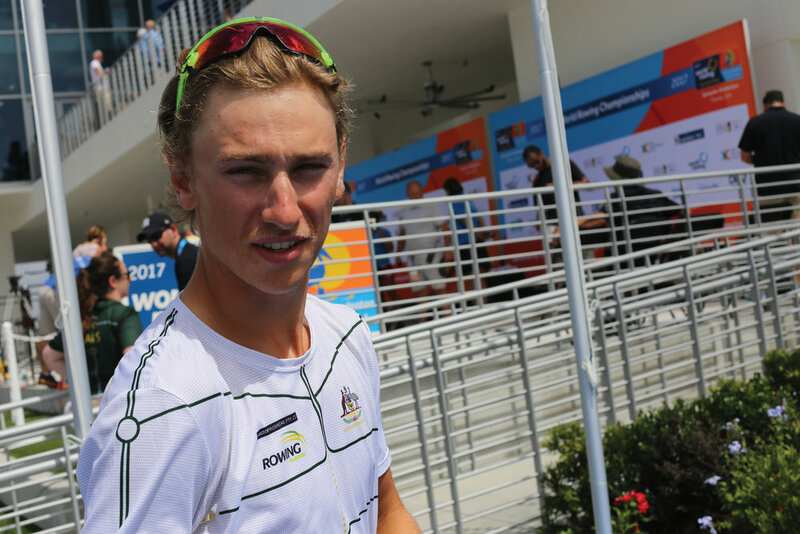 For James Rook, the Australian men’s national team coxswain, I wonder if the weight of the medal he won at the 2017 World Rowing Championships in the men's coxed pair got a bit more significant just days after he stood on the medal stand in Sarasota, Florida. Two days after Rook and his crew of Angus Widdicombe and Darcy Wruck took silver in the men’s coxed pair, in Sarasota, the World Rowing Federation (FISA) voted to bring gender equity to all events at the senior, para, under-23 and junior world championships; this vote eliminated the men’s coxed pair event. Rook is the youngest member of the Australian men’s team, but he had a chance to, as he says, “get a ticket to the Big Dance” after going through selection at the 2017 Trials. I asked him what he thought won him the coxswain seat on the team. Rook’s sandy blond hair falls across his eyebrows as he explains what he learned from being a part of the men’s coxed pair.”The first time I got into it I didn’t even know how it was going to move. I can tell you what it was supposed to do, but I didn’t expect how the hull moves and twists. It was an interesting experience steering for the first time. I find once it’s at racing speed I get more out of it.” Rook could just as easily be talking about a race car or a race horse, but he goes back to talking about the boat. This is a part of coxing that gets overlooked. What amount of effort does it take for the rowers to listen to a coxswain’s calls? And, if the calls aren’t making the boat faster through some change, some specific need the boat has at that moment, how much do the calls that are “filler” distract the rowers and slow them down? 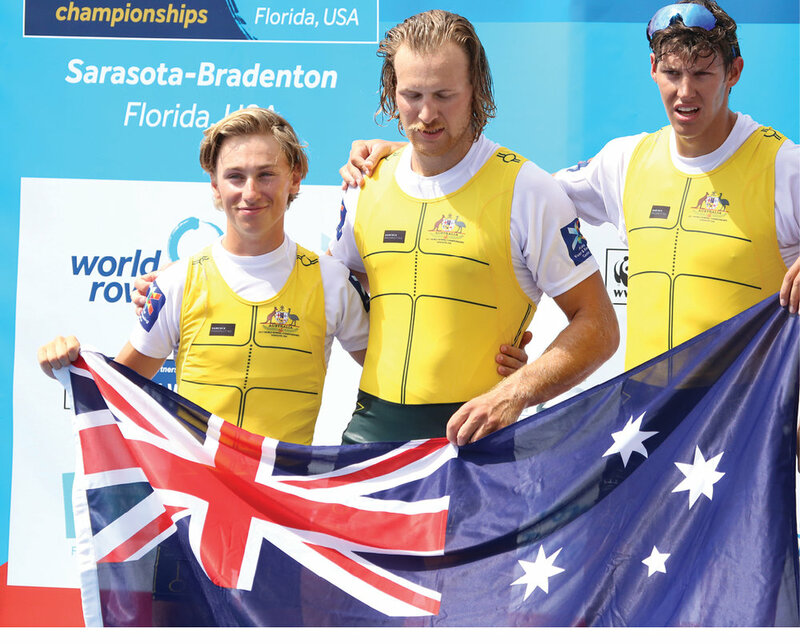 At the 2017 World Rowing Championships in Sarasota, Florida, Rook coxed the Australian pair to a silver medal and also coxed the Australian men’s eight. “It was almost a fairy tale,” Rook says with a quick flash of his signature crooked smile. “Someone was building a brick wall in our lane,” he says, as he describes the last 500 meters of the coxed pair race. “With 50 meters to go we had given everything we had. Hungary was at 105% of the world's fastest time in the last 500 meters. We weren’t going to catch them.” Rook’s frank assessment of the final race for the coxed pair is indicative of how he talks about his own coxing ability. Rook sees himself as a minimalist cox, one who needs to offset the weight he adds to the boat by focusing on the exact calls he can make not to break the rhythm. I ask him to explain how he approaches coxing only two rowers instead of eight. “Yeah, that’s just riding them like a jockey would ride a horse. You’ve just got to get on it a bit and get it moving.” He has learned that the effort of moving the coxed pair is different from moving an eight. Rook’s style of coxing changed between the pair and the eight at the world championships. “In the pair, we found ourselves up about fifteen strokes in and for me it was just talking at the same tone I am now, saying, ‘Just walk away. Keep doing the same thing you’re doing. Don’t change, just keep on it.’ In the eight, there’s not really much I say in the first couple hundred meters. Just a bit of body, maybe. Just catch a little. You know, whatever the boat needs. What followed was a scene many coxswains have been in. “I had actually wanted to row myself but I had one session and I said, ‘Oh, geez, it’s going to be pretty hard for me to get into a good crew because I’m not very big.’ So I came down the next day and was going to cox in the fifth eight. Then, all of a sudden, the forth eight coach didn’t have a cox that session and he said, ‘Oi, you, come here. You’re coxing my boat now.' I said, ‘Yep, fine.’ So I got promoted to the fourth eight before I’d ever been in a boat.” Rook coxed for three more years at Scotch College, moving into the third eight for his last two years. After graduating Rook enrolled in University, studying education, and then, when he made the Australian men’s national team last winter, deferred his schooling so he could train full-time with the team. Rook and teammate Darcy Wruck after their silver-medal performance in the coxed pair. Rook has a light air about him. I ask him how he has risen so quickly through the ranks as a coxswain and what is building as his reputation. His answer explains his personality: a humble and self-aware man. Rook’s experiences are exponentially developing his skill as a cox–at the highest levels. Before he heads back to this team tent, I ask him for his advice for coxswains who are trying to break into the next level. Rook is straightforward. Rook leans back and surveys the scene around him at the 2017 World Rowing Championships. “We go back to Trials next year,” he says. “I’ll try and make the team again, then the year after that do the same, and the year after that hopefully I’ll be in Tokyo.” Rook’s crooked smile appears again. As Rook stands and picks up his pack I thank him for the chance to talk. “No worries,” he says. Somehow, I think this is how he sees things. No worries. ROOK SEES HIMSELF AS A MINIMALIST COX, ONE WHO NEEDS TO OFFSET THE WEIGHT HE ADDS TO THE BOAT BY FOCUSING ON THE EXACT CALLS HE CAN MAKE NOT TO BREAK THE RHYTHM. Rook, Angus Widdicombe and Darcy Wruck represent Australia on the medal stand. "YOU CAN’T STICK TO A SCRIPT AND EXPECT TO HAVE THE BEST RACE OF YOUR LIFE. YOU NEED TO BE STOPPING AND ACTUALLY THINKING."